Brian Chenevert lives with his three cats in a one-bedroom apartment in downtown Worcester, Massachusetts. He’s unusually close with the cats. “I have a son, but he lives with his mom, and I don’t see him that often,” Chenevert says. “Otherwise, I don’t have any family.” Another thing he doesn’t have is a car, which can make it a challenge to get his animals the veterinary care they need. So when Chenevert recently heard that Cummings School was holding a free clinic at the St. John’s Church food pantry, he bungie-corded three cat carriers onto a dolly and set off on the 10-minute walk. At the clinic, his cats—Carbon, Tucker and Romeo—are checked in by a third-year veterinary student. Then veterinarian Emily McCobb, V00, M.S.02, who is a clinical assistant professor of community medicine at Cummings School, reviews the cats’ history and talks options with Chenevert. McCobb is able to offer him a voucher for free spay-neuter surgery, thanks to a grant from the Animal Friendly License Plate Program sponsored by the Massachusetts Animal Coalition. She tells Chenevert that she can also vaccinate the cats and treat them with preventives for fleas and other more common parasites, but that he will have to take them to an actual veterinary hospital to treat a tapeworm problem he says the cats have. When Chenevert explains his transportation problem, McCobb tells him about Tufts at Tech, a low-cost primary-care clinic that Cummings School runs at Worcester Technical High School; she offers him a voucher for free cab rides to and from the clinic. Chenevert seems delighted. He pledges to get the cats fixed now that he has found a veterinarian he can get to. Chenevert’s situation is hardly unusual. Just as many people live in so-called food deserts—areas where the lack of quality markets can make it difficult to get fresh, healthful food—many pet owners find themselves in veterinary-care deserts. In some rural census tracts, there are no veterinarians or pet stores within 10 miles. In urban areas, where many people don’t have access to cars, care can be just as hard to get to. “You can look at an urban area, say Brooklyn or Worcester, and veterinary services just aren’t there,” McCobb says. For other pet owners, particularly those struggling to meet their own living expenses, it’s cost rather than accessibility that can prevent visits to a vet. For instance, McCobb looked at poverty levels and pet-ownership rates in Worcester and found that in the city of about 180,000 people, there may be as many as 40,000 pets living in poverty. The result is a community of pet owners with little access to the support systems typically provided by animal shelters and veterinary networks. Over the past seven years, the outreach program has grown to offer weekly visits to the city’s 10 or so housing authority properties that allow pets. Now a selective course for first- and second-year students, Cummings School’s community-based clinics provide ongoing support, physical exams and vaccinations to about 200 animals each semester. A partnership with Becker College in Worcester gets veterinary students and veterinary technician students working together as they will after graduation. A number of local veterinarians and Cummings School alumni volunteer at the clinics, providing these vets with the chance to give back and Tufts students with the benefit of learning from these mentors in the field. “Tufts has always embraced the idea of a responsibility to give back,” McCobb says. “Providing outlets to do so is important.” The students themselves raise the funds that make those various outlets possible, relying primarily on corporate donations and grants from the Tisch College of Citizenship and Public Service at Tufts. 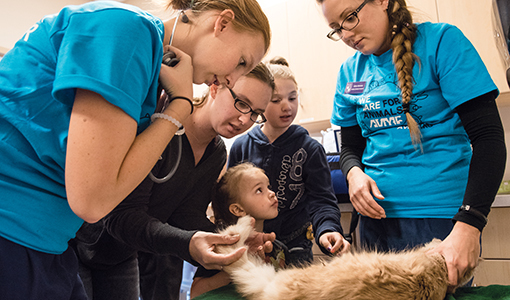 Most recently, students Lara Bower, V17; Jade Jerolmon, V18; and Sarina Selleck, V17, expanded the outreach selective by adding a monthly veterinary clinic that rotates between two sites that serve the homeless and others who need food assistance. In fact, today’s clinic at the food pantry grew out of a survey that Selleck took while volunteering in the soup kitchen at St. John’s. She found that there were at least 57 cats and 27 dogs belonging to clients at the soup kitchen that weren’t receiving veterinary care. With the help of the Central Mass Kibble Kitchen mobile pet-food pantry, Selleck, Bower and Jerolmon then set up the monthly clinics in 2015, providing care for 73 pets. The clinics were funded by Tisch College and a $10,000 grant from the American Veterinary Medical Foundation. That’s a shame, says Genevieve Frederick, who is the founder and president of Pets of the Homeless, because a pet may be a homeless person’s only connection to another living thing. “A number of veterans are living out on our streets, and pets give many of them something to hold on to,” says Frederick, whose organization provides funds for veterinary clinics and distributes pet food nationwide. Still, pets do require professional care. The idea behind the Tufts outreach program, then, is to bring that care to people who otherwise couldn’t afford it or get to it. And once again, that has benefits for society at large. Making sure that pets receive important vaccinations helps keep all of us safe. Recognizing that many places are underserved by veterinarians, the federal government offers loan-forgiveness programs for vet students, mostly for those who work in rural areas and on agricultural animals. But the Stanton-funded research being conducted by Cummings School raises an important question: Given the benefits of pet ownership for people who are homeless or living in poverty, do veterinarians who work with these communities deserve the same kind of government support? Whatever the answer to that question, McCobb believes that veterinarians, social workers, physicians, nurses and other human-service professionals must work together to come up with new ways of providing care to people who live in poverty and their pets. It’s an effort, in fact, that squares nicely with Cummings School’s One Health philosophy, which holds that doctors and veterinarians can best solve health issues in humans and animals when they work together. McCobb points to international programs that show how it can work. A 2015 Canadian study found that when health-care professionals asked people about their pets, it helped them learn about the human patients’ housing condition, financial situation, emotional health and lifestyle, all while increasing compliance with medical advice.